Happy Monday everyone, I hope you had a great weekend and here’s to having an absolutely fantastic week! I said that I had a lot going on this month for the blog and this week is going to be the most exciting!!! I hope you all enjoy the posts that are coming your way because I think you are in for a real treat. That’s because it’s holiday look book week this week on Mustangsallytwo! But this year I decided to do things a little differently. The holidays are a time where we spend time with family and friends but we also reflect on the things that we are grateful and most thankful for. One of the things I am most grateful for are the friendships I have made through blogging. I never imagined the people I would meet or inspire when I decided to take this journey, and I definitely never expected to find so many new great friendships from it, ones that I know will last a life time. And the best part is that there are so many more that I have formed with fabulous women who live all over the world! I wanted to celebrate these friendships and the joy of the holiday season with these fabulous women so I asked them to each shoot a holiday look with me where we could have fun and show off our individual style and mutual love of some of the amazing brands we love to shop. So alas, the #HolidayDoubleSlay was born! First up in this six part series is my boo Thera Warren of the blog Cloud 14+. For those of you who have followed me for a long time you may recognize Thera as she has been a guest on the blog a couple of times already. And for those that know my story, you will also know that Thera is one of two people that encouraged me to start my own blog and for that I will be eternally grateful. Putting that all aside though, Thera is one of those people that ou just can’t help but smile when you are around. She has a heart of gold and makes me laugh, especially when I am having a bad day. Her sense of style is beyond fierce, she can literally make a paper bag look so chic and sophisticated. And I love how much she has made me step outside of my fashion comfort zone. 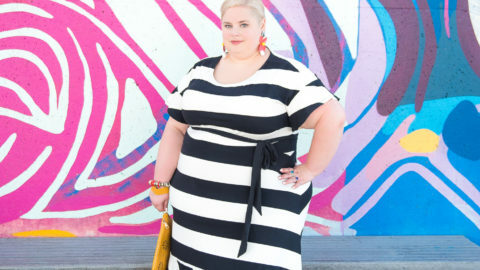 We both share a love for all things Lane Bryant so it was of course a logical choice to showcase some fab LB outfits for you for this look book. And of course because we like to be different, we decided to take on some non traditional holiday looks. For details on Thera’s look, head on over to her blog post here. It’s funny how sometimes fashion inspiration hits us out of nowhere. When we first started talking about what kind of look we wanted to do we both said we wanted to do something that wasn’t traditional. I had my eye on this skirt but hadn’t really seen anything that I loved to pair it with and Thera had wanted to try the tall pants and in winter white. Welll as luck would have it, the next morning in my inbox I found an email announcing a new Fast Lane Collection – Drama Club. Fast Lane collections are curated capsule collections that showcase all the next level trends and are only available in limited edition quantities. So when I saw this fur vest my outfit was born. This tiered tulle skirt is a perfect piece for any upcoming function you might have. Unlike other tulle skirts I actually found it to be quite lightweight and not too bulky. I absolutely love the beautiful blush colour that is so on trend right now combined with the pretty flower embroidery on the hem and the small ruffle trim above it. 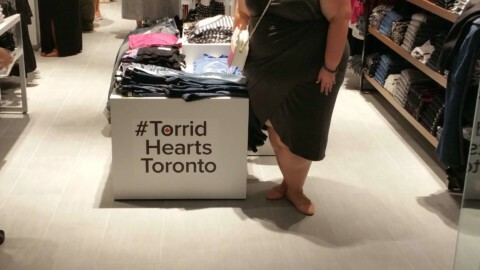 I am wearing the size 26/28 and I felt it was very true to size. It also comes in black and champagne. I love its feminine and girly vibe without it being too over the top and fancy. Faux fur is all the rage this year and I have to admit I haven’t always been a huge fan but I have been loving what I have been seeing this fall. I loved the block pattern on this vest in a neutral colour palette and of course pink, it is also super soft and fully lined. It has hook and eye closures and pockets. I am wearing the size 26/28 and it fit as I expected for Lane Bryant outer wear. If you can size up and want to wear the vest completely closed I would recommend sizing up. I wanted to keep the look casual and cozy so I decided to add a sweater which is something I typically never wear. I really loved the idea of the soft winter white with the sparkle of the pearls and beads in a quiet pattern. Surprisingly this sweater is pretty lightweight, I didn’t find it too hot and the material is also very soft and feels amazing to touch. I am wearing the size 26/28 and I thought the fit was very generous. So of course it’s not a post of mine if we don’t talk about my accessories. And if you haven’t figured out by now , Lane Bryant is one of my favourite places to buy them! So please don’t hate me but before you even ask these shoes are from Lane Bryant but they are from last year and unfortunately they don’t have anything similar this year. But let’s talk about these adorable shoe clips that are also from LB! I couldn’t believe it when I saw them on the site, because what is old is definitely new again. I remember my Mom and Aunts wearing them back in the day and always thought they were so stylish. I loved how they added a pop of glam to an otherwise ordinary flat. They would be perfect to dress up a simple black flat or pump. I then just added a simple metallic earring and pastel stone bracelet and grabbed a sparkly clutch from my collection and I was good to go. So there you have it, proof that holiday doesn’t have to mean red and green, sequins or glitz and glam…it can be white, soft, subtle and rich in fabric and texture. Who’s ready for cocoa? Both of our looks were provided care of Lane Bryant but all opinions are our own. Special thanks to LB for helping to make this project possible. And thank you so much Thera for agreeing to be a part of it all. Special thanks to Robert of Robert Skuja Photography for these magical pictures. You get prettier and prettier every day Lisa!